Whether you’re an omnivore cooking for a vegan, a long-time veggie, or somewhere in between, here are a few ingredients see as key in adding that extra little bit of oomph to a dish. Anywhere you need that little bit of extra depth, whether in gravy, pies, stews, wherever, then Marmite is your friend. Obviously you realise it’s a must-have staple for anything revolving around your typical Sunday roast. The GVC loves Marmite and wants you to love it too, so check out their “tips to help any nervous Marmite virgins earn their brown wings.” Vegemite is another option, but not my personal preference. I dismissed soy sauce for many years because I hadn’t had anything other than cheap darkened soy juice. Find yourself a quality soy sauce. In fact, find yourself many. There’s light soy sauce and dark soy sauce (milder but richer in colour), tamari, and a number of other options. Vegetables and stocks will come to life with a generous splash. Nutritional yeast, also know as “nooch” in some circles, is a staple in any vegan’s store cupboard. It’s a deactivated yeast with a nutty flavour which complements salads, potatoes, sauces and dressings, stir-fries, and more. Dark Miso pastes are another excellent method of adding a deep and rich flavour to a dish. Light miso is good too, but the sugar content is higher so be careful when using to “beef” up a meal! 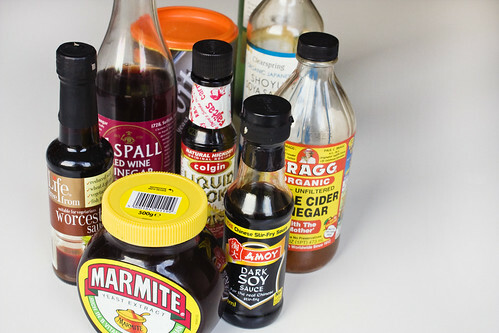 A personal favourite is red wine vinegar, a condiment I use in gravy for a roast dinner. A little bit goes a long way and it adds a full and zingy taste to stocks and pies. That said, I suppose it’s a little unfair to discount the all important red wine and white wine, both capable of lifting any dish from the depths of dullness to the height of flavour. If you’re cooking for a vegan or vegetarian, make sure they’re suitable though because lots of alcohol isn’t. Dried shiitake mushrooms make a fabulous addition to any stock. Seriously. If these aren’t in your storecupboard, get yourself to an Asian Oriental (and yes I’ve been informed this isn’t a politically correct term in the US, but “Asian” here refers to a different part of the world. I use the term purely as a regional reference) grocer and get some. The darkest of dark chocolate has the capability of adding some serious depth to a dish. Sound odd? It’s been used in Central and South American cooking for many many years. What staple flavour enhancers do you use? If you had to re-write my list, what would you leave out? Include? I would advise people who have migraines to go easy on the nutritional yeast. Yummy (mmmmmmmmmmm) as it may be ( did I mention mmmmmmmm), it can be a painful trigger for those peeps who suffer from migraines. Interesting! I'd never have thought. Great post. I have learned a lot. I am grateful to my friend who told me to visit your blog. Thanks a lot! Pomegranate sauce is great for depth. It’s a sweet and sour ingredient with the consistency of syrup. Great in lentil dishes. Nice with chili and other spices. I’m not a big fan of marmite and other umami-ish ingredients. Small doses. Smoked paprika and smokes salt are nice as well. It gives a nice depth to any dish and meat eaters usually love it – you know the spice called bacon?